Russia experts from across the globe give their impressions of Yeltsin’s legacy on what would have been his 80th birthday. Both Mikhail Gorbachev and Boris Yeltsin were born in 1931, and with the celebrations of their 80th birthdays comes a time to reflect. The two men charted the course of contemporary Russian history, but as time goes on, their political and personal differences have loomed large in any discussion of their legacies. “His book Perestroika: New Thinking for Our Country and the World turned immediately into a best-seller worldwide and he became a man highly esteemed in Western circles for seeming to be able to reform the Soviet system on behalf of its democratization," said Daniel Aarao, a professor of history at Fluminense Federal University in Rio de Janeiro. “However, he wasn’t capable of turning these great principles into policies, and that’s what Yeltsin did: He demanded that Gorbachev fulfill these policies,” Aarao said. Scholars of Russian history and politics do not have a unified view of Boris Yeltsin, the first president of the Russian Federation, who was born exactly one month before Gorbachev on Feb. 1, 1931 and died in April 2007. “Many people who don’t know very much about Russia see him as a big burly Russian with drinking problems,” said Kaj Hober, an International Law professor at University of Dundee. “But he was the one who took the lead in the dissolution of the Soviet Union, back in August 1991, when he famously stood on a tank outside the Russian Parlament - which was a very positive thing,” said Hober, who was also an adviser during that era to Anatoly Chubais, one of the architects of privatization. “The view is mixed,” said Neil MacFarlane, a professor of international relations at St. Anne’s College of Oxford University. “On the one hand, he ended the Soviet Union, which is seen by most – but not all – outsiders to be a good thing. On the other hand, his record of governance is pretty mixed, and the government was substantially weakened during his time." “I think one of his real tragedies is the personal antagonism that he and Gorbachev had. It would have been far better for the Soviet future if the two of them had not had such a bitter personal falling-out - because Yeltsin certainly shoved Gorbachev aside,” said Robert Donaldson, a professor of political science at the University of Tulsa. 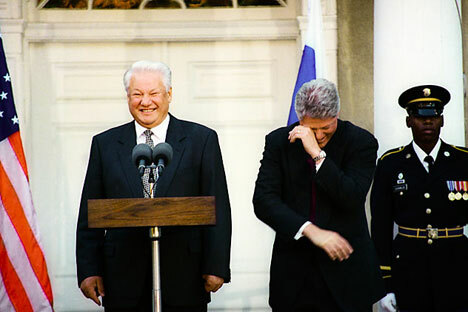 Yeltsin’s popularity increased as he responded to the frustration over plans Gorbachev proposed but wasn’t able to accomplish. “People in then Soviet Union used to say: ‘We open the fridge and don’t see perestroika inside it,’ because the goods started to be scarce and the crisis was becoming deeper and deeper, creating opportunities for an audacious, ambitious and daring alternative, such as Yeltsin was at that time,” said Aarao. The disastrous management of the economy that followed, although, wasn’t entirely Yeltsin's fault, according to MacFarlane. The country's economy was suffering because low prices for energy resources and other commodities. However, Yeltsin contributed to the problem with his inability to control the rapid acquisition of wealth by oligarchs who bought state assets at very low prices and then marketed their products at world prices. “He failed to resist the growing influence of these people over the political process,” said MacFarlane. “He certainly did have a commitment to a more open political process and to a more populist appeal, based, at least initially, on the people’s support, but unfortunatelly he fell under the influence of the oligarchs and corrupt forces and he’s lost touch with the people,”said Donaldson. For MacFarlane, Yeltsin's legacy continues to play out in Russia's current political climate. “The countinuing large-scale support for Putin and now Medvedev is a measure of popular disillusionment with Yeltsin, and the poverty, disorder, and criminality of his time in office,” MacFarlane said. And yet, Yeltsin's legacy has positive elements. During the 1996 elections, despite the possibility of a loss to Communist Gennady Zyuganov, Yeltsin went through the electoral process. “Not simply the trying of creating a new country out of the chaos of Soviet colapse, but then ensuring that the election continued to be used as the way of putting a leader in place is a very important contribution of his,”said Donaldson. “I think Yeltsin, like Gorbachev, will be remembered more fondly, as time goes on. We are still too close to the 1990’s, which were turbulent times for Russia," said Donaldson.